Perkins, Ruth Alice. Essentials of Pediatric Nursing, second edition. Philadelphia, F. A. Davis, 1932. Perkins, Ruth Alice. 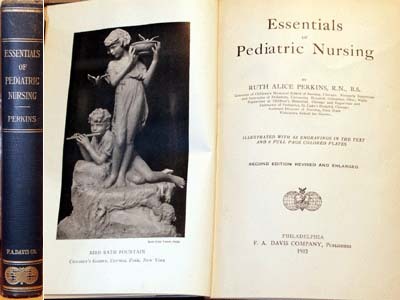 Essentials of Pediatric Nursing, second edition with 55 engravings and 6 full-page colored plates. Philadelphia, F. A. Davis, 1932, 467 pages. Size: 6" x 9" x 1.25"